The Hayabusa® Team shed some light on how best to protect your hands and wrists in relation to the potential injuries facing anyone who participates in combat sports. Unsurprisingly, the hands and wrists bear the brunt of most injuries picked up by professional fighters across the wide spectrum of combat sports. To give yourself the best change of staying as injury free as possible, it is of vital importance that the equipment you use provides you with the utmost protection for your most valuable weapons. One of the most common hand injuries suffered by fighters, is what’s known as “boxer’s fracture”. 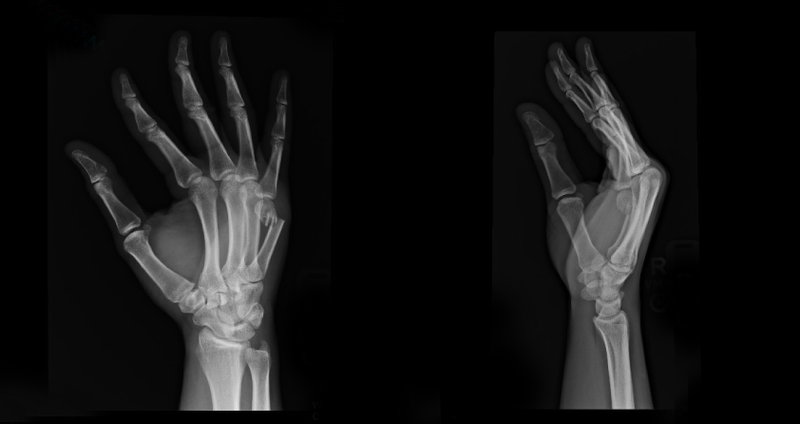 “Boxer’s fracture” occurs when the neck of the fourth or fifth metacarpal (the bone just beneath your ring or little finger) breaks under pressure. When striking a hard surface with a clenched fist, the impact force travels through the knuckle down in to the metacarpals. A lack of protection from the equipment being used by the fighter, or if his or her striking angle is incorrect prior to impact, can cause the delicate metacarpals to break off at the neck, thus causing the “boxer’s fracture” injury. To greatly reduce the chance of such an injury, it is important that your striking gloves provide you with the best hand and wrist support possible. Look out for gloves with an energy absorbing, high quality inner core that will effectively disperse the impact force energy. Hayabusa’s “Deltra-EG Inner Core” featured in certain models of their gloves, ensures that such protection is delivered. The “Deltra-EG Inner Core” provides unrivalled hand protection and ensures that the impact force is safely absorbed, this negates the intensity of force on the knuckles and metacarpals. Wrist injuries are another common and potentially debilitating injury that fighters run the risk of becoming a victim of. One of the most vital bones in the wrist, the scaphoid bone, when damaged can massively effect the future performance of a fighter. Such injuries to the scaphoid bone can be caused by a misaligned punch as well as poor equipment. (See Wrist Injury X-Ray – Bottom Left). As with the aforementioned “boxer’s fracture”, wrist injuries can also be vastly reduced if suitable protection from an athlete’s equipment is provided. Keeping proper alignment of the hand and wrist will stand you in good stead in minimising such injuries. The “Fusion Splinting” technology found in certain Hayabusa gloves will go a long way to ensure the correct and safe hand and wrist alignment is maintained, greatly decreasing the potential for injury. Further to bone fractures and damage, the potential for tendon and ligament injuries is another risk faced by combat sport athletes. Such delicate connective tissues are particularly vulnerable for fighters, due to the high impact they’ll undergo, especially in the hand and wrist areas. Again, poor equipment and poor technique can contribute to such injuries, as well as a strike from an opponent. Therefore it is imperative once again, that you give yourself the very best chance to reduce the chance of another injury that can be potentially so destructive for you as a fighter. To do your part in minimising the risk of tendon and ligament tears and breaks, make sure that your hand / wrist alignment is well protected and supported by the equipment you use and of course, that your technique is correct.